If you haven’t danced to DJ Dopamine, maybe you could use a little, well, dopamine. 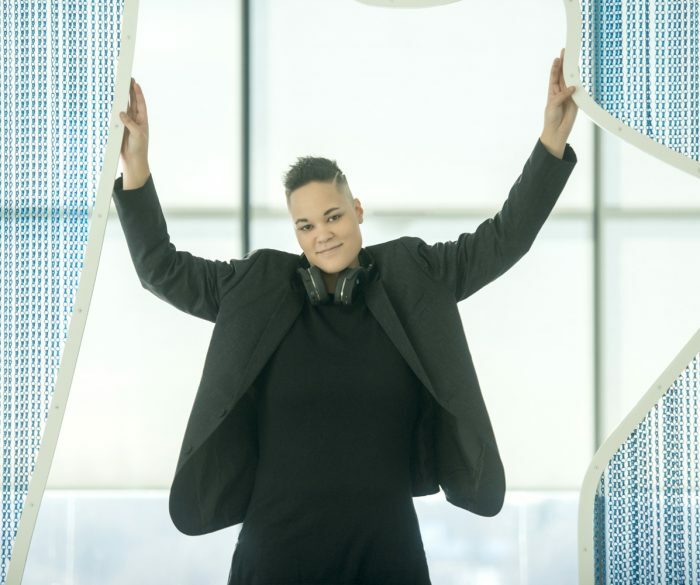 A queer DJ originally from Calgary, she does everything from hosting her own radio show, to playing at major festivals and pride parades—including our own Flygirl parties. We’re so excited to welcome her to Vancouver for Pride this summer. We got to chat with her about her career, what it means to be a queer electronic DJ, and the importance of queer visibility. Flygirl: Tell us about your name—where did DJ “Dopamine” come from? DJ Dopamine: It’s a funny story. At a Flygirl party when I was younger, someone said I looked liked “dopamine.” So I ran with it. Flygirl: A Flygirl party! We’re honoured to have been a part of your name. So you started out in Calgary. What was it like going from Calgary to Miami to California? DJ Dopamine: It was amazing. It’s something I’ve always had as a goal since I started DJing. I love the vibe and energy from both coasts and feel blessed that I am able to travel and share my music in all these places. Flygirl: That’s awesome. What would you say was your most memorable gig? DJ Dopamine: There are so many moments for me, it’s hard picking one. My first moment was in 2013 when I had a crowd sing the lyrics back to me. I knew from that moment this is what I wanted to do with my life. Flygirl: You host a weekly radio show on Latino World Radio in LA—tell us more about it! What do you try to share with listeners on that platform? DJ Dopamine: My show, #DopeSessions, brings the weeks hottest club and dance remixes in a 1 hr mix. It’s mostly focused on Latinx artists and vocalists. There’s not much talking because I LOVE music and speak through that. It’s on at 10pm PST Friday Night and is the ideal pre-party mix to get your night going. We’re just passing the 1 year anniversary and couldn’t be more excited to see what year 2 brings! Flygirl: You do amazing mashups. What’s the hardest thing about doing them? DJ Dopamine: I do mashups live all the time while I mix. A lot of it is hoping the songs work together and sound good. I practice a lot and compete in DJ competitions often to stay on top of my game. Flygirl: That sounds intense. You identify as a queer woman; what’s it like, being a queer woman in the electronic music scene? DJ Dopamine: It’s different for sure. I have had to fight a lot for my visibility being a queer colored woman. Now it’s really cool because, via social media and live shows, I meet and connect with all these different people. Because they saw me being visible, they feel like they can also be visible within their communities. Flygirl: What are you excited about next? What’s coming up for DJ Dopamine? DJ Dopamine: This past year has been a whirlwind of shows so I’m hoping that just continues. I am so excited to come play at Flygirl—I still remember the feeling walking into my first Flygirl party. I loved being at Dinah this year and will probably go there every year to connect with the fam! I want to get back to Toronto and Miami with some shows, some Central/South America, Caribbean festivals would be great too! Thanks so much for chatting with us, DJ Dopamine. If you want to see her play at Pride this summer, be sure to get your tickets to the closing Hershe party on August 5th, where she’ll be performing with Stephanie Rice!